We bought our copy of the Linksys WRT300N Wireless-N Broadband Router in early 2008 for roughly $125; our first-ever Wi-Fi router purchase. The WRT300N worked well and non stop considering that it was a DRAFT N router, for nearly seven years before it finally failed, providing unusually vast signal coverage for all the more power it’s rated to transmit. The dual antennas along with the reflector plate between them provided full-bars signal throughout our home, and it also worked silently and exceptionally well throughout a one-bedroom apartment, in close proximity to many other Wi-Fi networks. Later, we replaced the Cisco firmware with dd-wrt, which provided a range extender, repeater function, so we could get a stronger Wi-Fi signal at our backyard pavilion. Though this effectively halved the available end-to-end network maximum data rate, Internet radio streaming still worked perfectly; particularly since our Internet speed at the time was just 25 Mbps down / 5 Mbps up. With today’s typical broadband speeds topping 100 Mbps however, we avoid Wi-Fi repeating unless absolutely necessary, because of how severely it constrains bandwidth. However, if you need a highly reliably range extender, then this device is second to none when running the dd-wrt firmware. Linksys WRT300N V1 Broadband Wifi Router, Front View, showing the status lamps and antennas at right. The unit either stands up on its side via a supplied detachable stand, or can sit horizontally, as pictured above. It’s fanless operation means that the WRT300N make no noise and collects very little dust inside; though this router does tend to run warm. Extra important therefore, to keep all vent holes clear. Numerous front panel status LEDs. These include Power, Internet, 2.4 Ghz, 5 Ghz., LAN ports 1 through 4 activity, USB, Wi-fi off, and WPS availability lamps. These LEDs change colors and blink, indicating the various statuses that this router can assume during startup and normal operation. See the Users Manual for a complete description of these displays. Minimum button and switch compliment. There’s a “Reserved” button on the top of the unit (pictured above), which seems to do nothing when pressed. The only other button is the RESET pushbutton, located on the back, and pictured below. All connections made on the back panel. Rear panel ports, shown below, include the WAN port (blue), LAN ports 1 through 4 (yellow), the WAN port (yellow), and the power adapter port on the far right. RESET Button. Located near the LAN ports on the back, the recessed RESET button can be pressed with the end of a safety pin, when you wish to restore the WRT300N to factory default settings. No fans. There’s no cooling fan inside to draw in life-shortening dust. The heat-generating components seems effectively vented without a blower, although the WRT300N does run warmer than seems typical for similarly powered routers. External power supply. Since power adapters are the largest power-handling workhorses in a wireless router setup, they tend to fail more often than any component in the router itself. Keeping the supply external therefore, means that if it does fail, the consumer can replace it without having to learn much technical expertise. Optional stand included. The WRT300N may sit flat on a table, as pictured above, or stood on its end if you snap on the included stand. Adequate Wi-Fi coverage is assured ether way by appropriately positioning the adjustable antennas. But you might wish to side-end the router when little horizontal foot-print space is available. This router works well in either position. External, adjustable antennas. Though not removable, the external antennas can be adjusted through a wide range or positional combinations, to tailor the shape of the Wi-Fi signal coverage “bubble” to your specific environmental circumstances. The square shaped middle antenna acts as a beam which can be aimed into distant or weak-signal areas around your home. Four LAN ports. Provides four Fast Ethernet connections for wired devices to be included in your local area network (LAN). Can add more ports by connecting any one of these to an Ethernet switch or hub. Fast Ethernet speeds throughout the router. All ports run at best, at 100 Mbps. No gigabit Ethernet speeds on the WRT300N. MIMO Technology. Incorporates multiple radios for increased range, faster, and more reliable wireless network connections. Wireless N speeds. We’ve achieved data rates of 130 Mbps through this router’s wireless access point (WAP), which is more than twice as fast as Wireless G speeds at 54 Mbps. Adequate streaming performance. Our streaming audio and video devices work markedly better, including DVRs, tablets, smart TVs, and iPhones. Movies from Netflix stream virtually stutter-free, with no “buffering” messages. Short boot-up time. The WRT300N becomes fully operational in well under a minute after power up. By comparison, other wireless routers can take as long as three minutes and beyond. Older wireless standards supported. IEEE 802.11 b/g/n on 2.4 Ghz. only. Dynamic Domain Name Service (DDNS). The WRT300N supports automatic IP address updating of your dynamic domain name address, when you use services like DynDNS.org or TZO.com. Performing this function on the router eliminates the need to install and run a DDNS updater program on one of your local network computers. Gaming support. The WRT300N provides port forwarding, port triggering, and basic QoS traffic prioritization features. Universal Plug and Play (uPnP) support. Either wired or wireless uPnP clients on the network can discover and communicate with each other. Stateful Packet Inspection (SPI) Firewall. Router inspects each incoming packet from the Internet, and drops it if deemed malicious, before injecting it onto your LAN. Virtual Private Network (VPN) pass through. Supports devices on the local or wireless network here to establish secure VPM connections with remote servers on the Internet. Used to ensure secure workplace-to-home connections. DMZ support. Can be configured to bypass firewall protection, and allow direct Internet access to a specific DMZ (demilitarized zone) server computer on your network. One of the four LAN ports discussed above, serves as the DMZ port. Wireless MAC address restriction option. The WRT300N can block wireless devices attempting to access it, via their MAC addresses. All device clients are allowed by default. Activity logs. The unit can be set to keep a log of routine and error conditions encountered in its memory, that you can access via its web interface. Or, it can email you the log info periodically. Maintains both a general log as well as a wireless system log. WPA and WPA2 authentication support. Both personal key and enterprise key mode via a RADIUS server are options. AES and TKIP encryption support. 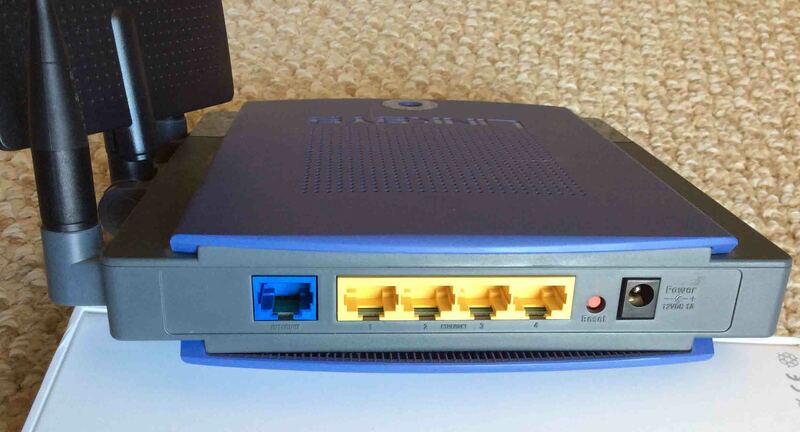 Linksys WRT300N Wi-Fi Router, Rear View, showing the antennas (left), wide area (blue) and local (yellow) Ethernet ports, reset button (red), and power port. No mention of hardware based network address translation. If accomplished through firmware only, this could mean slower Internet performance; particularly within high data traffic applications like video surveillance, or video movie streaming services. No wireless AC support. Not that this router does not provide 802.11ac WiFi speeds. The fastest wireless protocols available on the WNDR4300 are 802.11an. No WPS button. To authorize new wireless clients on this router, you must manually select the corresponding wireless network and manually enter the network password. Old-fashioned linear power adapter. The 12-volt, 1-amp, positive tip power supply, is not as efficient as today’s switch mode models, though ours never failed once. These transformer-based models of the 1990s offer less regulation and less protection from voltage spikes and surges. Yet the WRT300N always seemed stable, requiring rebooting almost never. So, while in principal we’d prefer a switching supply, the linear supply used here never seemed to suffer any of the disadvantages of linear power supplies. Non detachable antennas. This limits Wi-Fi antenna selection options by the user, and may impede the best attainable coverage and performance somewhat. However, since the built-in antennas are external and adjustable, they can be repositioned easily to eliminate Wi-Fi dead spots and null signal areas in an essentially omnidirectional setup. Choose a router with removable aerials however, if you need precise directional control of the signal through Yagi or parabolic dish antennas. Single band only. The WRT300N operates only on the 2.4 Ghz. radio band. The higher speeds of dual band mode with 5 Ghz. are not present on this router. No USB device support. You will not be able to access USB storage devices via the WRT300N. So, no file sharing directly from a USB storage device, unless you attach it to a computer on the network and share it from there. Single WAN support only. So, no load balancing or Internet fault tolerance between different WAN networks available on this router. Non adaptive QoS. The WMM QoS in this router prioritizes network traffic among connected devices and the Internet according to static rules only. It does not change priorities based on prevalence of specific types of network traffic it sees. More recent and higher cost routers like the Asus RT-AC87R, do provide this functionality however. No system recovery option. Should a firmware upgrade be interrupted or some other cause of firmware corruption occur, no immediate means is provided to restore the router to its previous, working version of the firmware. Note however that firmware parameters can be restored, if you’ve previously saved a backup of the router’s configuration file. No guest networks. There are no Wi-Fi guest networks available on this router, that would allows people to access other devices on your network as well as the Internet. All clients connect to the same Wi-Fi network and by default, have the same resource access rights. Firmware upgrades done manually. No automatic firmware update detection or installation on this router. These installations require a computer connected to the router’s local wired network to complete. May require rebooting if attached WAN equipment is restarted. To consistently restore full performance to our network, we’ve found that if we reboot our cable modem, then it’s best to also reboot this Asus router. Sometimes the RT-AC87R Wi-Fi connection after a modem restart is slow and erratic until this equipment is also cold started. This situation however, will likely improve with subsequent firmware updates to this router. No wireless AC support. Note that this router does not provide 802.11ac Wi-Fi speeds. The fastest wireless protocols available here, are 802.11n on 2.4 Ghz. only, which is approximately 130 Mbps. The Cisco Linksys WRT300N broadband has been an okay-priced and excellently-performing Wireless N router among the few we’ve owned. We particularly loved the 130 Mbps speeds, which at release, were state-of-the-art, as well as the extensive web-based setup and control interface, which gives you control over tens of LAN, WAN, WLAN, and security settings. The seasoned IT professional will appreciate this vintage router’s plethora of advanced settings and attributes, yet also enjoy its very streamlined interface. Though the WRT300N was initially dubbed as a Wireless DRAFT N device, we experienced no instability, data slowdowns, or lockups while using it over the past seven years. 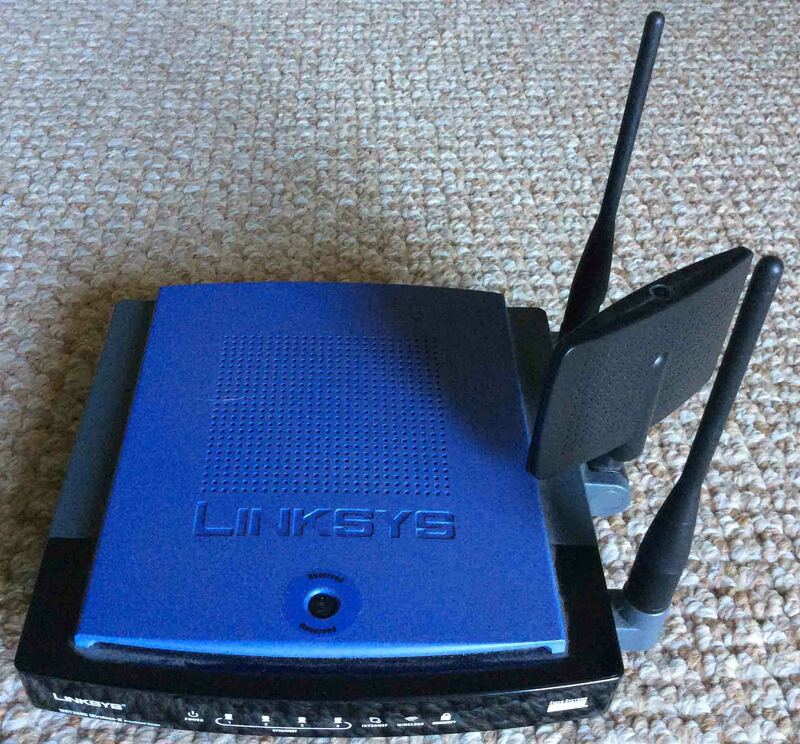 We hope that Cisco Linksys continues the tradition of nearly faultless design and construction that this router has, and if not for the higher data rates and faster microprocessors of today’s routers, we’d certainly buy another WRT300N. So we’d rate this router at 96 out of 100.